One of the reasons I wanted acreage when we moved south was so I could have at least one dog, and I wanted to raise some kind of pet-type animal. My thoughts went to mini- horses or donkeys. After the move, I realized my much-better-half was highly resistant to having more dogs. Go figure; just because my 2nd to last dog, who was a BIG German Shepard, bit him. Twice. I mean, geez, the dog had just had a leg amputated due to bone cancer the first time. The second, Mike had startled Falcor, who was deeply asleep on the bed with me. Anyway, no dogs broke my heart. There is just nothing like the companionship of a dog. As it turned out, my health prevented me from getting any of the farmyard animals I’d hoped for, also. March 2013. I knew our local pet store worked with the feral cat TNR group here in town (and probably the shelter too), and that they took in unwanted rodent and rodent relatives, then sold them for just enough to cover care and housing. I went to them to find my guinea pig. At the time, they had 4 or 5 of the little critters. I chose one who was mostly black, had a little white on one hip and some on his chest, but the most interesting thing about him was the white half-crest on his head. I’ll admit, I couldn’t see the others very well but from what I could see, none of them stood out. I asked how old it was, boy or girl, and what he needed to come home with me. They weren’t sure about his age, but guessed at least a year, then sold him to me, along with a cage and accessories, food, water bottle, etc. I believe it was then I bought a tiny little cage to transport him home in and to travel to the vet’s when necessary. Like I said, I did my “research”. I set the cage up in what would normally be a dining room. It was a regular pet store cage and once I added a little hidey for him, he didn’t have much room to move around. For the first couple of weeks I barely saw him; he was the shyest creature I’d ever met. If I went near the cage, he disappeared and all I could see was a bright little eye peering out at me. I reached the point where I started calling “peek a boo” whenever I came into the open area that was living/dining/kitchen. I hadn’t named him yet because I couldn’t seem to think of one that fit. Then it hit me. Duh. Peekaboo he became. I will be looking forward to more stories! It took only a couple of days to realize I wanted to know more about my precious little scaredy cat, errr guinea pig. I bought the only guinea pig book the pet store had – the one published under Animal Planet’s name. That book only left me with the knowledge a child would need. I wanted info for an ADULT. So I turned to the internet. I found all the generic animal sites: HSUS, Petfinder, ASPCA, etc. Again, it was all written for kids, not near enough information on the cavies themselves. Not in depth, anyway. I don’t general trust websites I’m not familiar with, but finally (again, DUH!) I went to Guinea Lynx. Holy Cow! Now HERE was information! And the kind of information I wanted. Within a few days I knew I needed a bigger cage. Reading on Guinea Pig Cages, I decided I wanted a cage big enough to house 2, just in case, right? I talked it over with the Mr. and he agreed we needed to give the guinea pig (still nameless) a healthy home and for it to be happy. I ordered the cage – medium, with patio and lid (neither of us trusted the cats), and fleece flippers to fit. It would take a couple of weeks to arrive. I learned the foods they liked, the foods that were dangerous to them, a little about their physiology. I learned how hard it is to find a guinea pig vet, let alone one truly qualified. 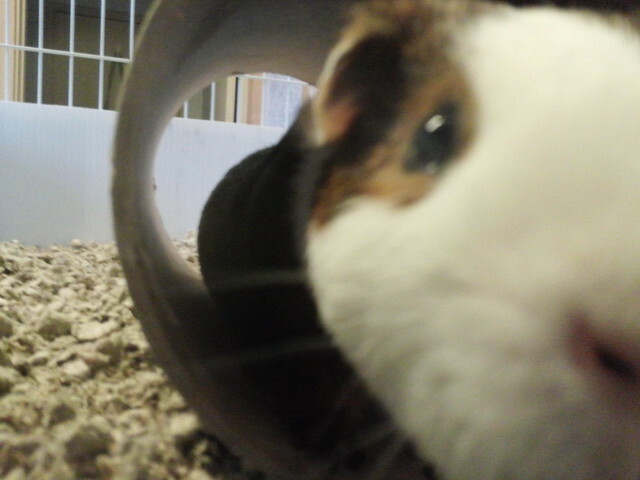 It had never occurred to me that most vets do not include guinea pigs in their practice. 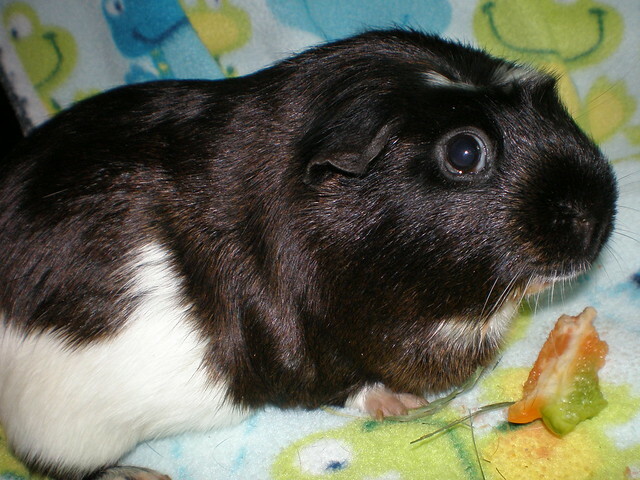 Besides, who on earth considered guinea pigs “exotic”? Practically every little kid I knew had one. I asked about vets at the pet store where I’d purchased him. They weren’t sure but they thought the vet they used up in Olympia saw guinea pigs. (Oops, my esteem for them slipped a tiny notch. If they only “thought”, then that meant they didn’t actually take any pigs TO the vet.) Olympia is a 45 minute drive away on a good day, and since I’d already given up driving for safety reasons, that meant I’d have to ask Mike to take us up for a well-baby checkup. I didn’t want to ask him to do that, the guy already does so much for me. So I put it off. I mean it wasn’t like the little critter had bugs or anything. He seemed perfectly healthy to me. The little boy’s cage came in and Mike spent hours putting it together. “I love you, not them.” I’d ordered the cage that has “legs” and bins, thinking I could fit all of the supplies in it. (What a total idiot!) I think he spent longer putting the drawers together than he did on the actual cage. They really caused him fits. When it was all put together I was surprised by how big it was. After some furniture shuffling and removal, we slipped it against the wall in the “sitting” room. I put the flippers together and inserted them into the cage. Then I added the guinea pig and his stuff. At first, he still wouldn’t come out of his hidey, but when I let him be and walked away, he got brave enough to explore. A couple more days and I learned what “popcorn” and “zoomies” were. My baby was happy. It took a few more weeks for me to decide on his name, though. I still only saw an eyeball unless I took the hidey away. Still had to catch him if I wanted to pick him up. Still thought he’d “warm up” to me. Mike said he was surprised at how long it was taking me to break through the little guy’s fear and reserve. I’m usually best buds with domestic animals in a matter of minutes (not including children); wild ones take a week or 2. Peekaboo was at weeks – plural. I’d pull up a chair and watch him, did a LOT of talking to him, but for the most part, I didn’t pick him up very often, still thinking he needed “time”. A month or 6 weeks into *our* introduction (failure #1), I decided to believe what I’d read about guinea pigs needing companions. Maybe Peek just preferred cavy to human, and always would. I knew he’d been surrendered to the pet store with another pig, but at the time, I only wanted one, not knowing he needed his friend/sibling/mother/father. (Besides (bonk on the head of the totally clueless! ), they thought his companion might be sick because it was losing hair, and they didn't really feel comfortable selling a possibly sick animal.) Back to the pet store. No guinea pigs available. I was NOT getting a female. No way, no how, no siree did I want baby guinea pigs. I knew enough about them to know they reproduce like rabbits, and I know ME well enough to know we’d soon have guinea pigs coming out of our ears if I brought a female into the equation, because I wouldn’t want to give any up. (Biggest reason I’ve always had my pets spayed/neutered!) Not happenin’. I went on the waiting list for a male. It actually took weeks to get the call. Scatter exploded into our lives. You are a good writer! And people reading will get an education!! Really enjoying your stories so far! this is really good so far :) good post! Awesome writing! I love your stories, and the pictures are so cute! Thanks, everyone. I do love to write, and I REALLY love to brag about my "kids". Lynx, along with the bragging, I'm hoping I can help new owners to avoid some of my mistakes. I'm also hoping they see that the most important first step is research, NOT getting the critter. Love the story and the two boys are really handsome! Look forward to hearing some more. I see Peek has read up on stink eye here as he has that look down! Very sweet. I love reading the Chronicles and your story. In that pic of Peek... I'm pretty sure I'd just finished cleaning his ear, so yeah, he WAS giving me the stink eye. Take your time, I'll just sit here and wait!